I’ve been using this hair treatment for the past couple of months, (I’m coming close to the bottom of the tub as you can see from above!) and the packaging says that “For really damaged hair, we recommend applying this once a week for six weeks”. I can now give a thorough opinion on this, after following the tip. 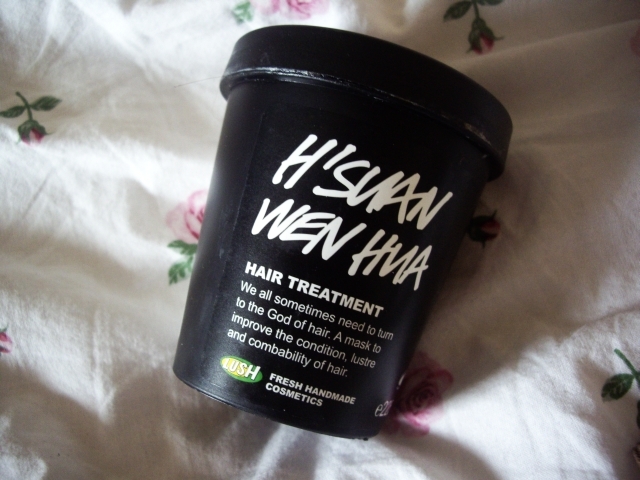 I walked into Lush, and one of the assistants pointed me in the direction of H’Suan Wen Hua (£8.50), a deep conditioning mask to treat damaged hair. My hair has had pretty much everything thrown at it, from bleach to a different hair colour every 6 months. I abuse it with blow drying, straightening and curling, so every now and again it could really use some TLC. I’ve been slathering this on my dry hair once a week, covering it with a thick layer and leaving on for 20 minutes before washing it out, then shampooing and conditioning as normal. This stuff is quite amazing! I noticed a difference in my hair the first time I used it; my hair felt thicker, softer and brighter. 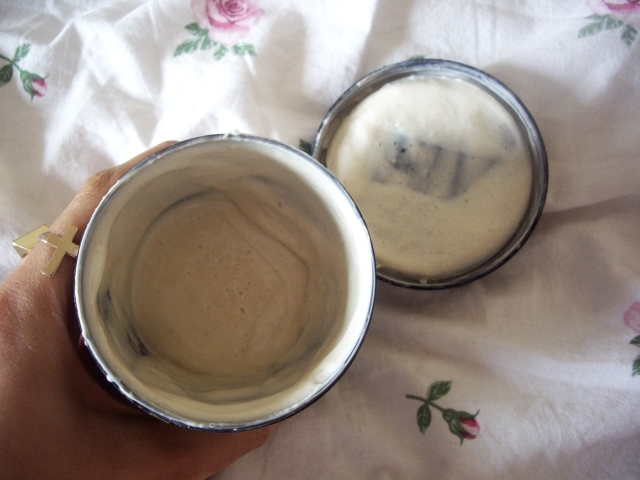 I’m still using it now, as my hair is quite short naturally so I don’t need a lot to cover it. There is one big downside to this hair treatment; the smell. It has a very, very, strong and questionable scent. It contains all, fresh and natural ingredients, but there’s a few I can definitely pick up on; egg, balsamic vinegar and cinnamon leaf oil. When mixed together it’s very pungent, which can be hugely off-putting at first. The smell also stays in your hair for the next day or so afterwards. It’s not a bad thing, as long as you can get used to it. I definitely recommend this product as a good hair treatment, but not for the scent! When I was in the Lush store I was recommended another hair treatment, Marilyn, when my hair was ombred. I didn’t think it would be much use at the time, as only my ends were blonde, and that one was specifically for blonde hair. However, now I’m fully blonde, I think this will be the next hair treatment I’ll try, and from what I can remember, it smelled much better than H’Suan Wen Hua! If you’ve tried this product or any other Lush hair treatments, let me know in the comments below.